This is a second in series of blog posts on the landscape of my childhood home:Part 1 is here, Part 2 is here, and Part 3 is here. During the summer months, we spent as much time as possible outside in the street. We lived at the end of a cul-de-sac so traffic was light. We always had plenty of neighbors who were around our age and the local attractions like the Field and the Creek provided endless fascination. As I got older, I began to wonder where the street really was and what was there before. Aerial photographs can provide some idea of how the Street fit into its historical environment. The earliest settlement in the area of the Street was Arden. Arden was founded in 1900 as a single-tax commune. By 1922, it spurred the developed of adjacent Ardentown and in 1950, Ardencroft. 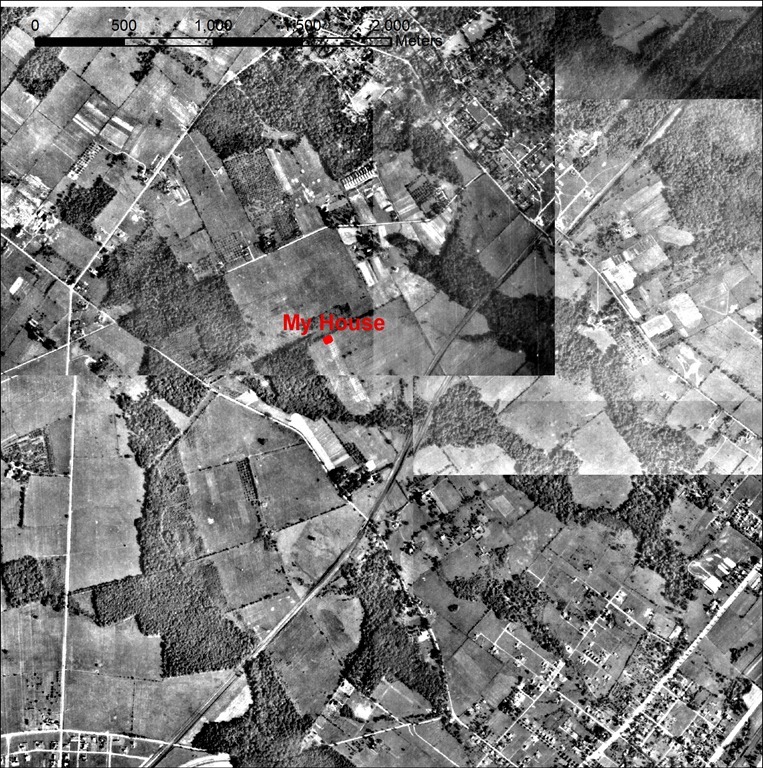 The communities of Arden and Ardentown are clearly at the top right of the 1937 aerial photograph below. At this time, most of the land around what would eventually become “the Street” was farmland bounded by Arden, Silverside Road to the southwest, Marsh Road to the northwest and the railroad to the southeast. The community to the far southeast of the photograph below is the town of Claymont, Delaware, which dates back to the colonial period. Claymont has become a bit better known today as one-time hometown of Vice President Joe Biden. (Biden worked for a few summers at Windybush pool). 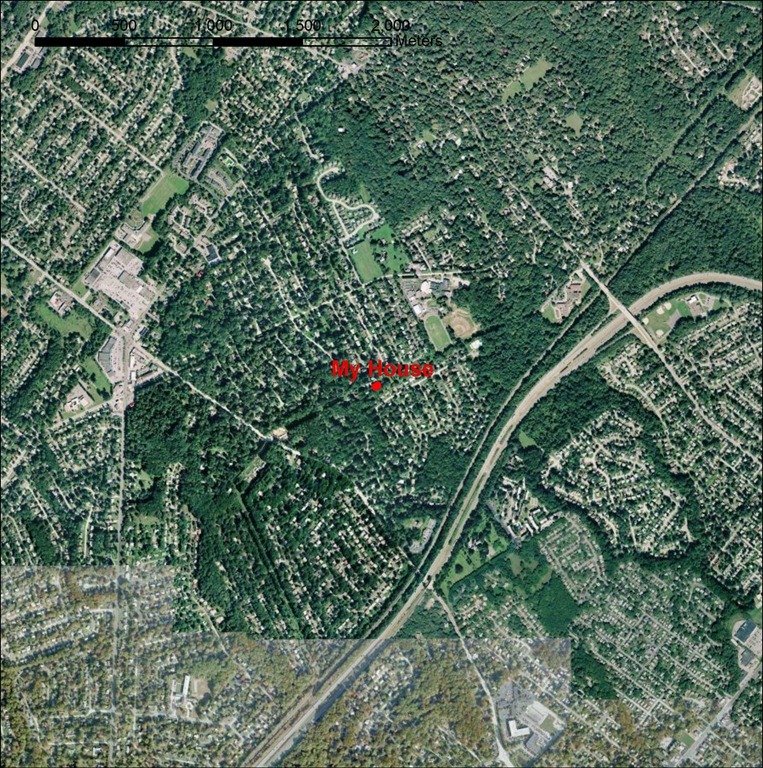 By the next round of aerial photographs, the area had seen significant development with Claymont pushing to the northwest and the clearing of the land for the Windybush neighborhood clearly visible. 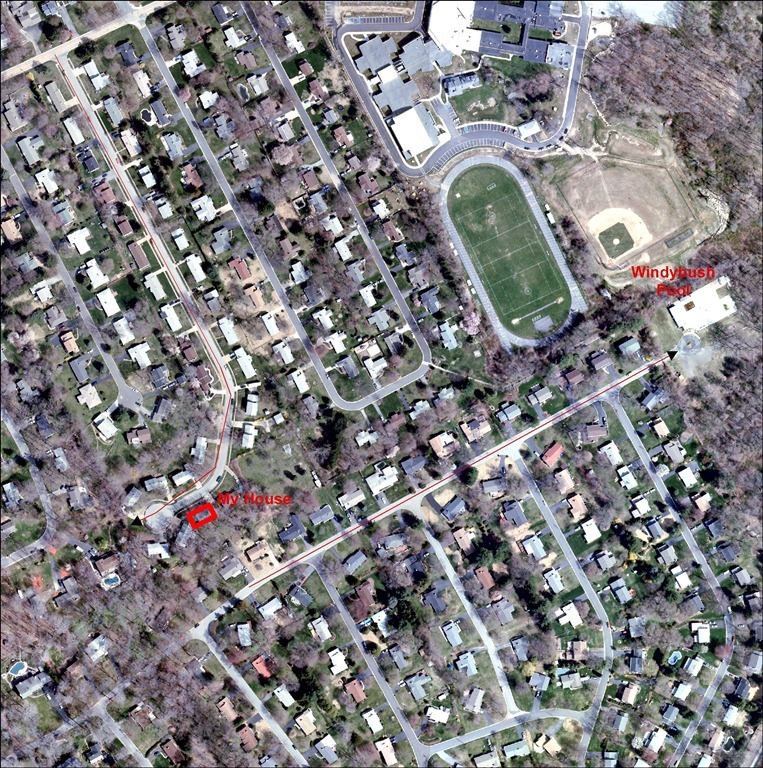 The Arden area also seems to have pushed to the southwest across the line of Harvey Road which connected that community to Claymont. 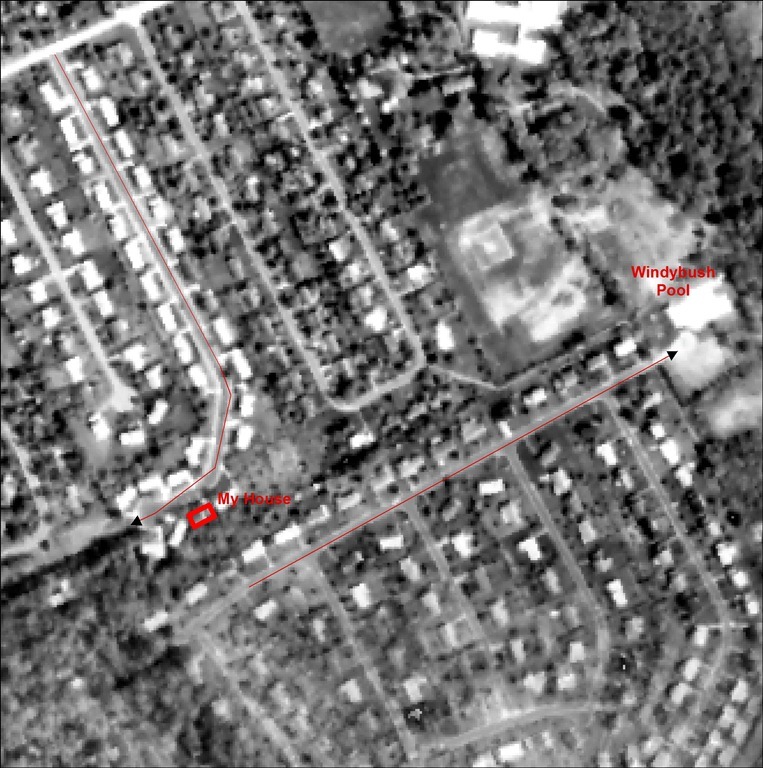 Immediately to the west of the future location of “The Street” the neighborhood of Westwood Manor had been carved out of a wooded area. The future site of our neighborhood, howevever, remained farmland. The neighborhood we called Northfield had been developed (perhaps it was the north field of the local farmer?) and it would appear the land that would become Hilton was partitioned. The Street, meanwhile, remained an orchard. The clearing cut through the southern limits of the orchard (and coinciding exactly with the future location of the Street and the Field) was an easement for high-tension power lines. By 1961, the entire area had been developed. The change is dramatic!!! It is notable, however, at the in 1961, The Street was not developed. The orchard was still there to the northeast of our house and the farmland immediately to the east of our house would continue to exist into my childhood as the massive back lot garden of a local Windybush resident. 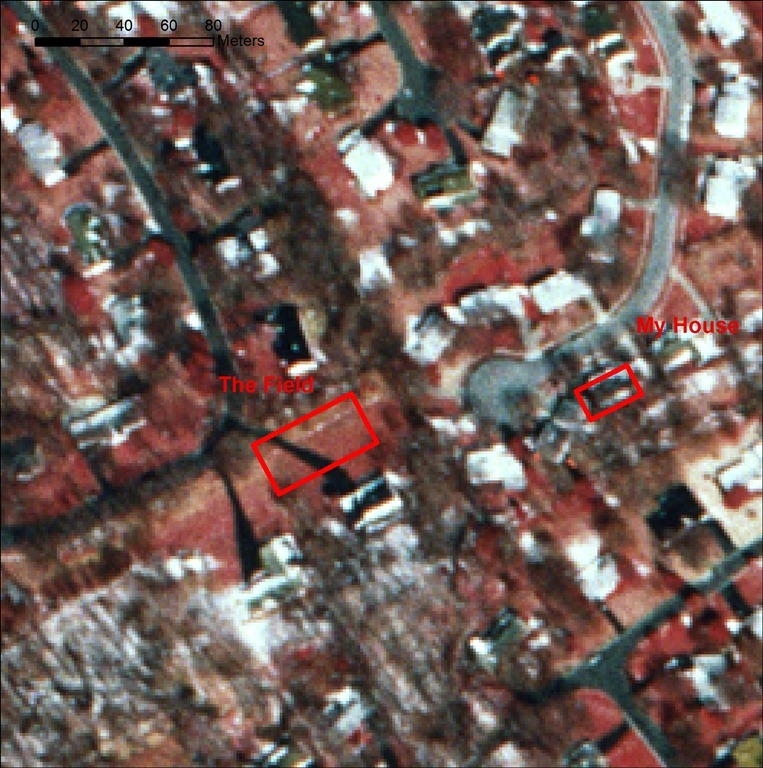 I suspect that some of the mature fruit trees in the man’s back lot dated to the before Windybush or the Street. The biggest change to our local area came in 1963 when I-95 cut between the northwest expansion of Claymont and the southern sprawl of the neighborhoods surrounding the Street. 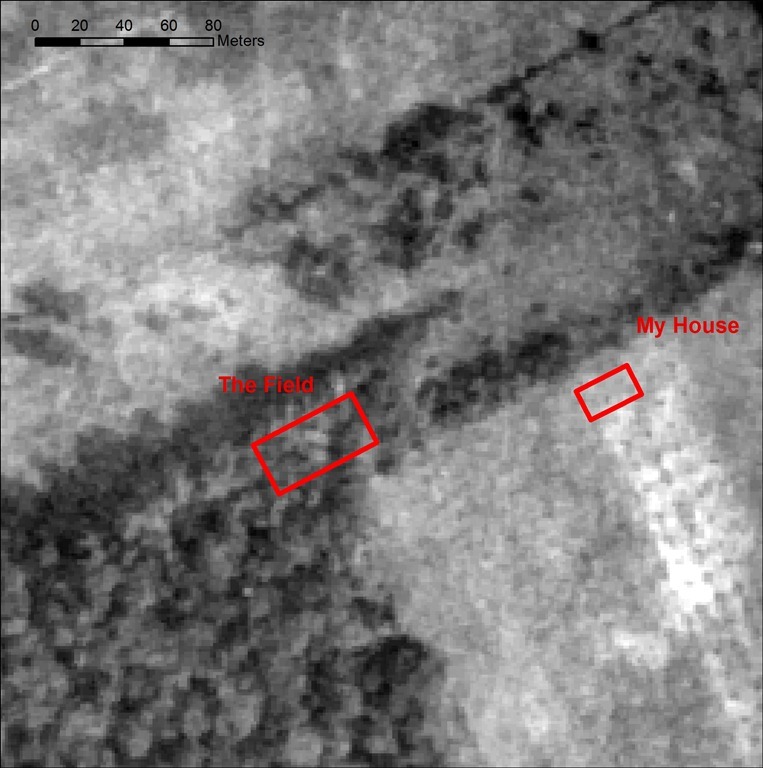 According to the county, our house was built in 1962, so a year after the 1961 aerial photographs. The Street is called Wheatfield Drive suggesting the earlier use of the land (but also a generic, rustic neighborhood name). 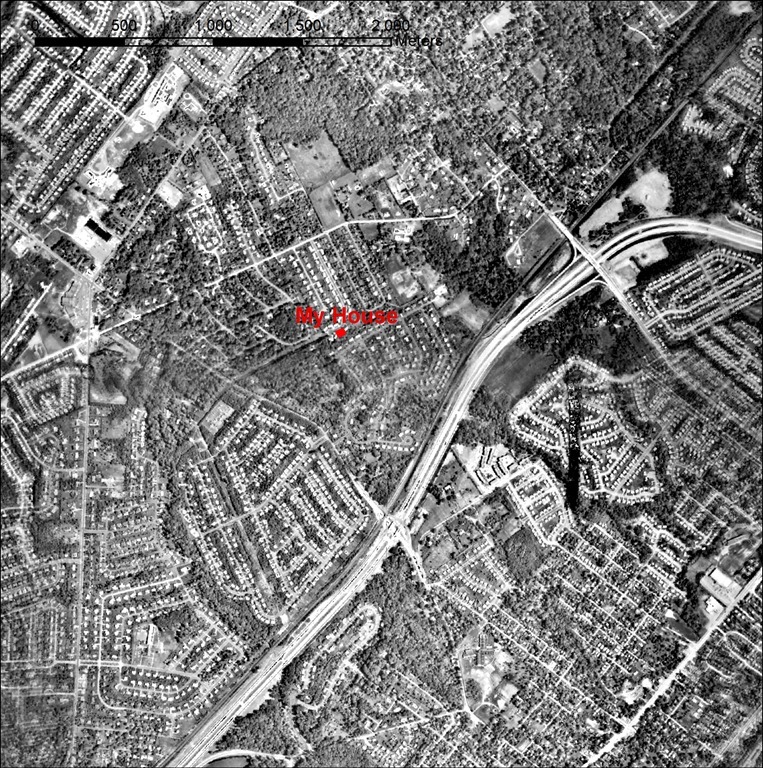 The 1968 aerial photographs document the appearance of I-95. It connected to our area via Harvey Road. The detail shows the preserved fields to the east of our house. 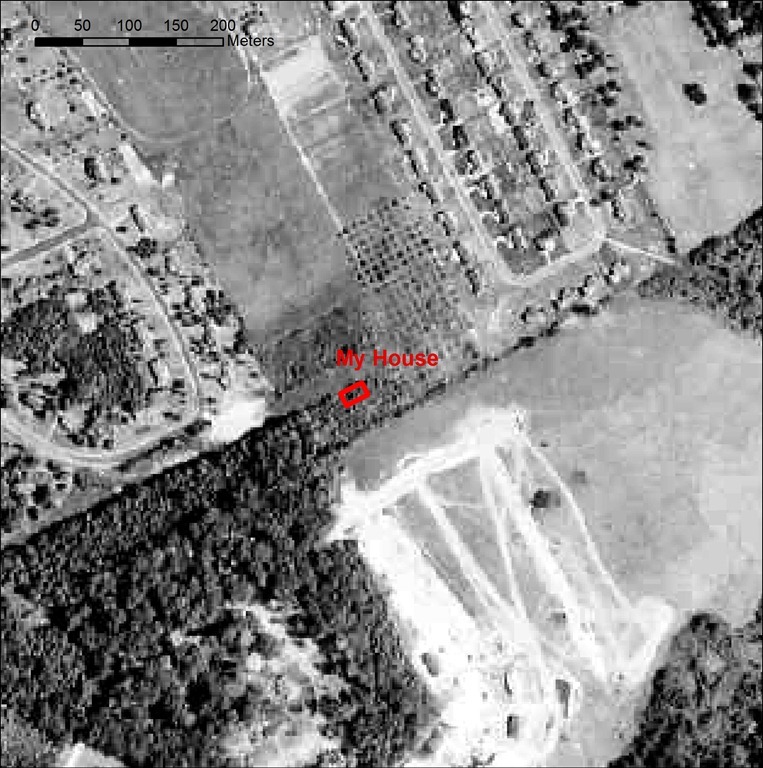 Moreover, it shows our house backing onto a wooded area that had originally stood between two fields. Our backyard had an old dog-wood tree and a massive tulip poplar typical of older, hardwood stands in the area. These trees clearly pre-dated the development of the area and stand as a reminder of the earlier organization of land in the area. I lelf the area for college in 1990, returning only in the summer. As one might expect, development of the area continued with gradual encroachment on the few remaining open fields. In general, the wooded areas remained. 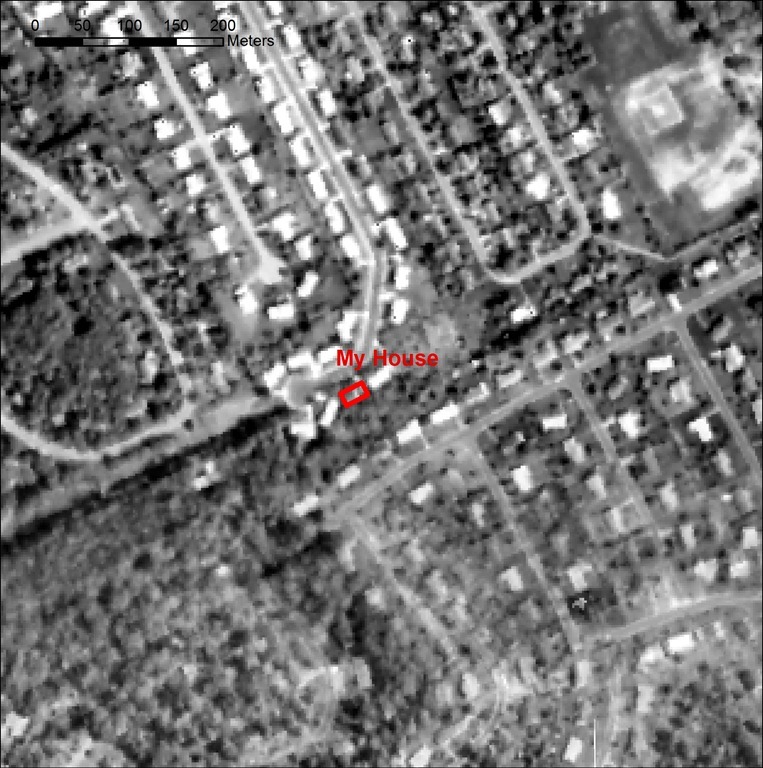 The aerial photograph below is from 1992. This is a second in series of blog posts on the landscape of my childhood home: Part 1 is here, Part 2 is here. As a kid, “the creek” provided an enduring source of interest and fascination. The Creek itself was pretty modest. 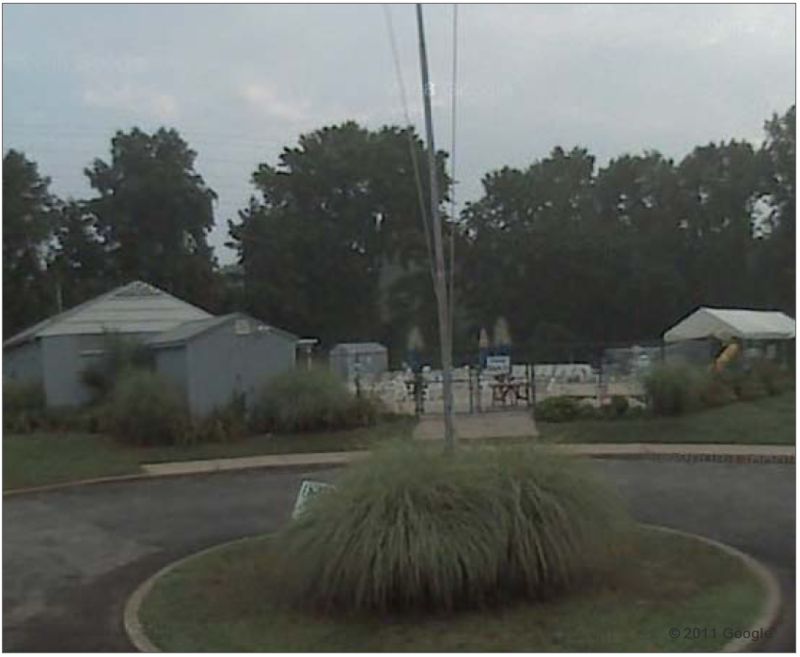 In fact, it does not even appear on the standard hydrology map of New Castle County. It “began” in a neighbors backyard and was fed by the local storm drains. It curled its way through “The Woods” (which I’ll talk about later) before merging with a larger creek around .5 km to the south. Needless to say, we did not have a particularly global perspective on the course of our creek, except that it flowed out from the safe confines of our neighborhood into the great beyond. 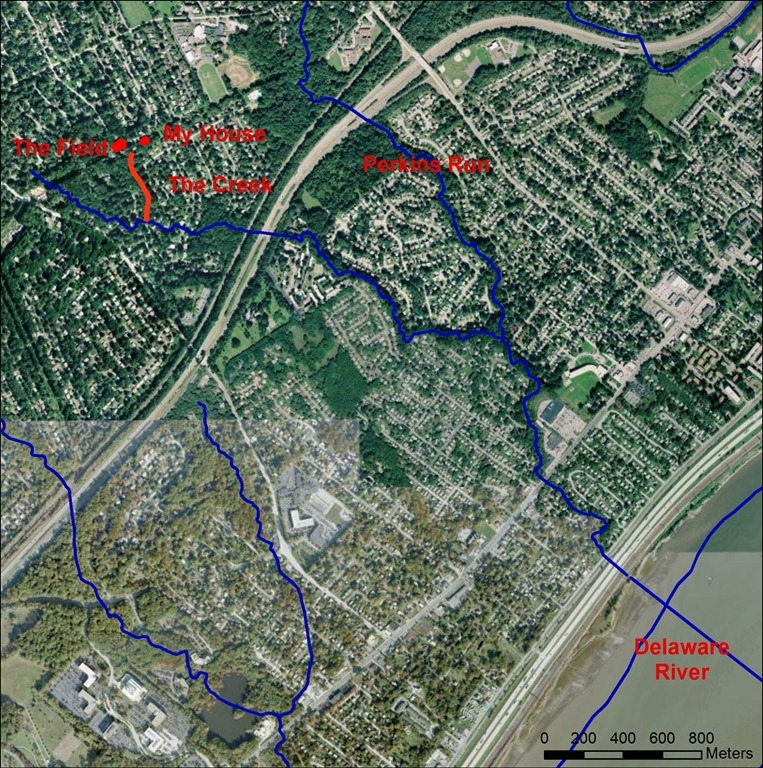 Like many of our pre-modern predecessors, we recognized that the creek could serve as a route out of our neighborhood and beyond. 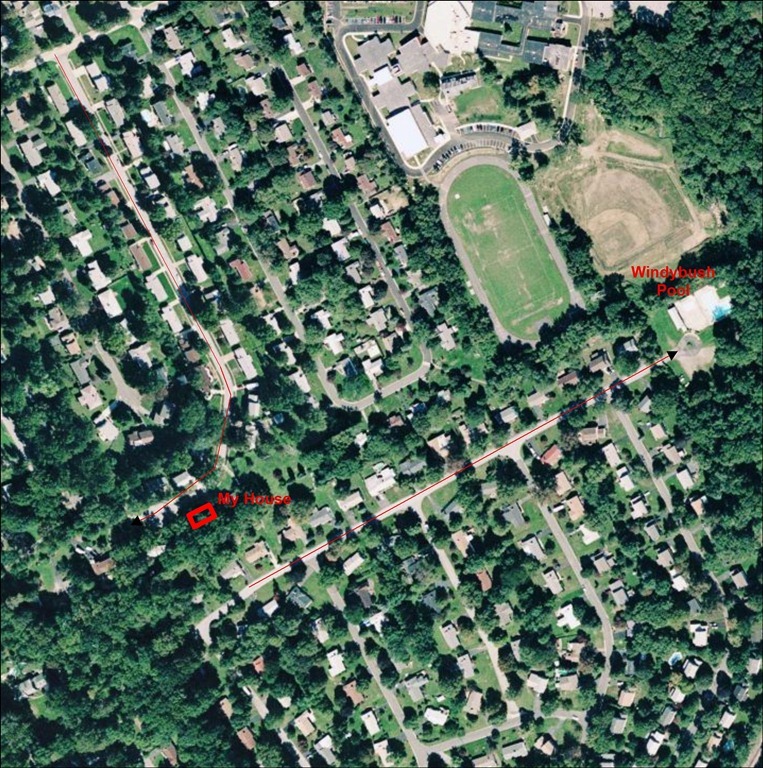 Generally, the acknowledged boundary of “our creek” was the footbridge at the western end of Windybush Road. 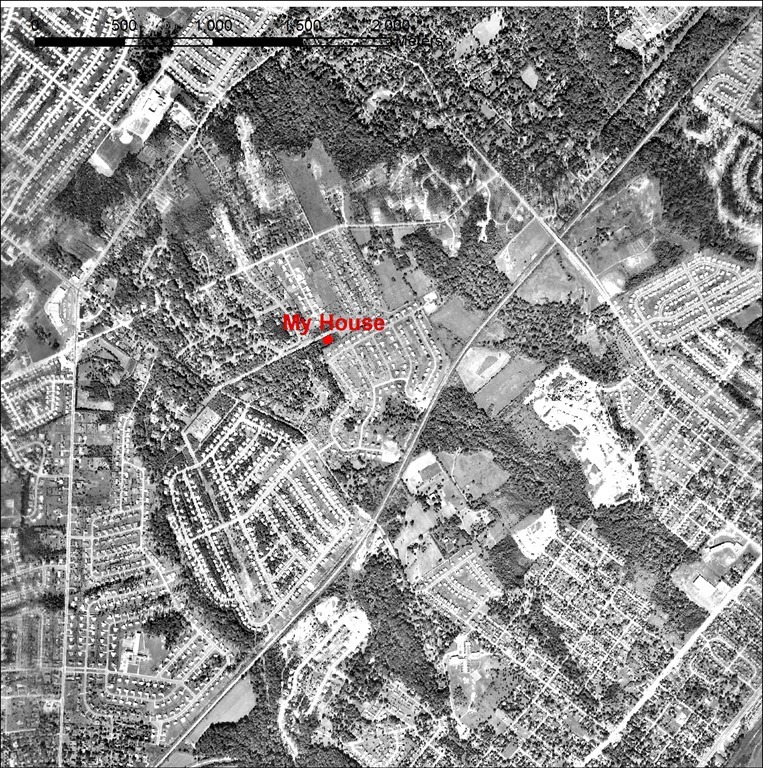 For some reason the developers had not connected the neighborhood of “Old Windybush” with the “newer” subdivision. “Old Windybush” seems to only date to a few years before “New Windybush”. The oldest houses in Old Windybush appear to date to right around 1950. New Windybush to less than 5 years later. 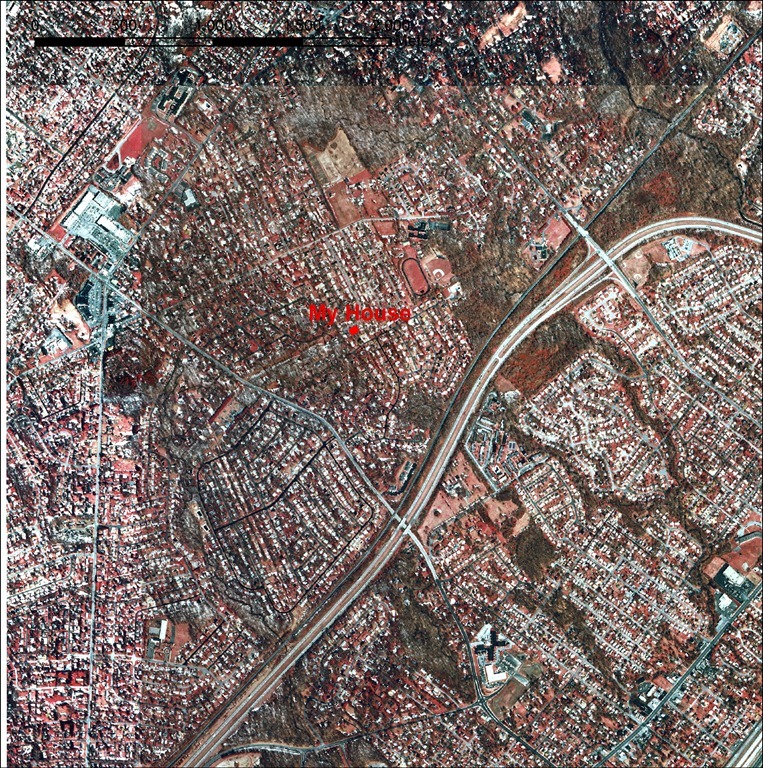 There is no reason to assume that these two subdivisions were developed separately. In any event, the Creek continued to wander through backyards of Old Windybush before merging with another creek and continuing to the east. I have clear memories of ruins of perhaps an old farm house standing somewhere along the route of the creek. Examining the 1992 aerial photographs which were taken in the winter with what appears to be an infrared filter does not show any obvious buildings. About .5 km from the confluence of our creek and the larger creek, the larger creek passes under the railroad tracks and the interstate, I-95. We rarely tracked the creek this far, but I do recall following it under the interstate. Of course, this may not have been our creek, but Perkins Run to the north. About 1.5 km after passing under I-95, our creek joins with Perkins Run which empties into the Delaware River after another 1.5 km. Perkins Run was the much more substantial creek and it ran through the woods to the East of Windybush pool. We certainly followed this creek for most of its course as kids and I remember discovering where it joined with the mighty Delaware (or at least where is passed under I-495). As kids, the creeks were more than simply routes between neighborhoods. They were another example of “wastes” that fueled our imagination. We discovered salamanders, observed (what we thought to be) tadpoles, built bridges and dams, races boats made of sticks and leaves, inevitable fell into the water and got wet and muddy. We also confronted the unknown as we adventured south out of our neighborhood. I have to wonder whether the engagement with the landscape so close to home influenced my decision to become an archaeologist. I clearly remember the thrill of going just a bit further along the Creek and being amazed at finding ruins so close to my own backyard. This is a second in series of blog posts on the landscape of my childhood home. Part 1 is here. At the end of our road in Wilmington, Delaware, there was an open field. We called this plot of land simply, “The Field”. Technically, it was part of the easement for the high-tension lines that ran through this section of North Wilmington. 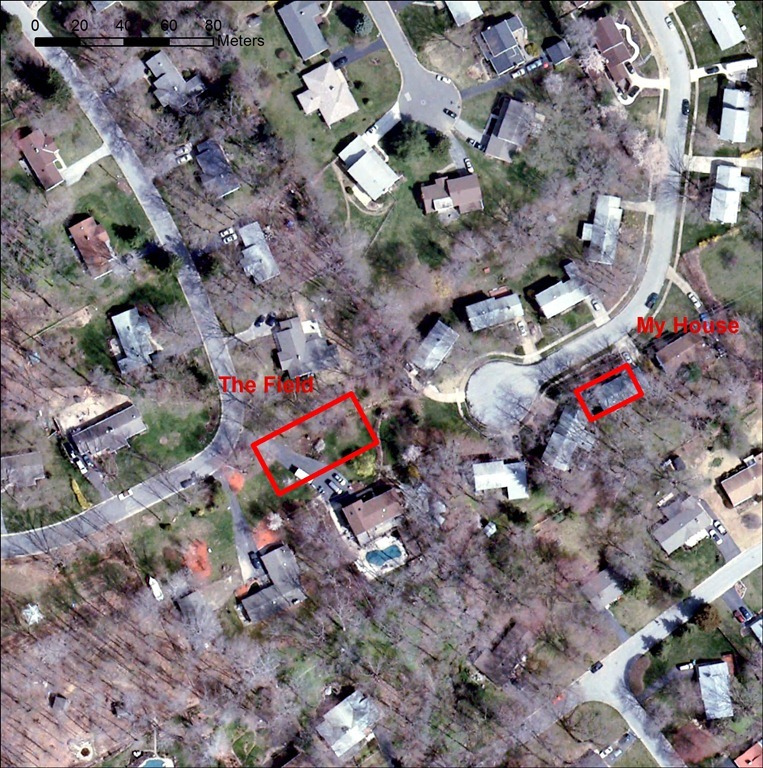 It fit between two developments, ours, and the neighboring Westwood Manor and as such, it fit into almost any definition of “liminal space”. We accesses the field by wandering up a driveway at the end of our cul-de-sac and passing to the north of a wooden fence. A well-worn dirt path extended from the top of the driveway to a bend in a road in Westwood Manor. By linking these two developments, we were able to by-pass the busy and narrow Veale Road and get access to other main thoroughfares – particularly Silverside Road – which were wider with bike lanes. The southern part of the field was bounded by “The Woods”. These kinds of waste areas – so prized by peasants in the Middle Ages – formed the edge of our imaginative world. As far as I can recall nothing much ever happened in the field. It was usually overgrown so not particularly conducive to sports, although I have a vague memory of playing some kind of sports on it a few times. It lacked any distinguishing features – like rocks or holes – to capture the imagination. There were legends, of course, about the field having caught fire once. 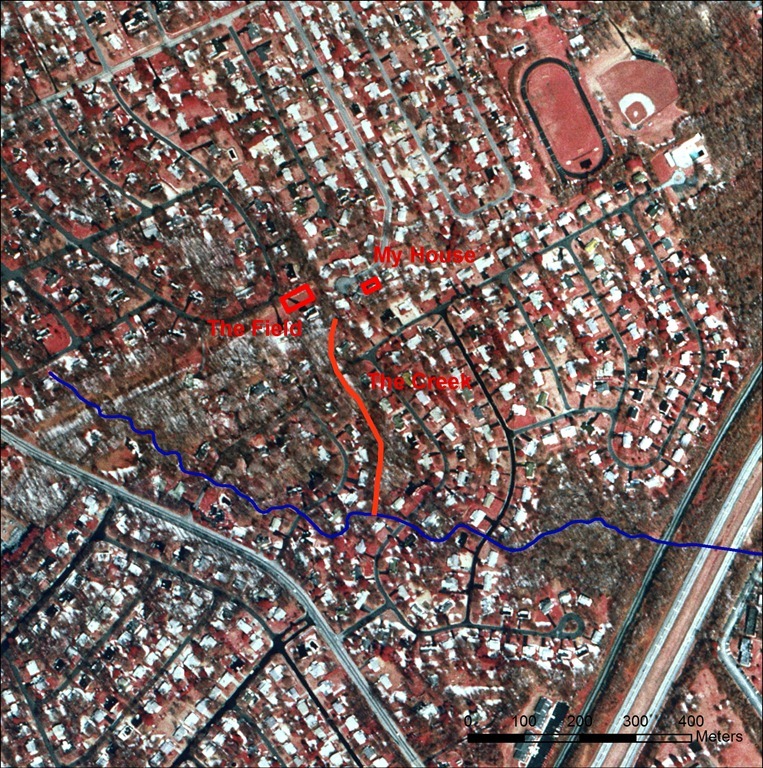 Mostly, however, it was route between two neighborhoods and a buffer zone between our space and space that was a bit more foreign. 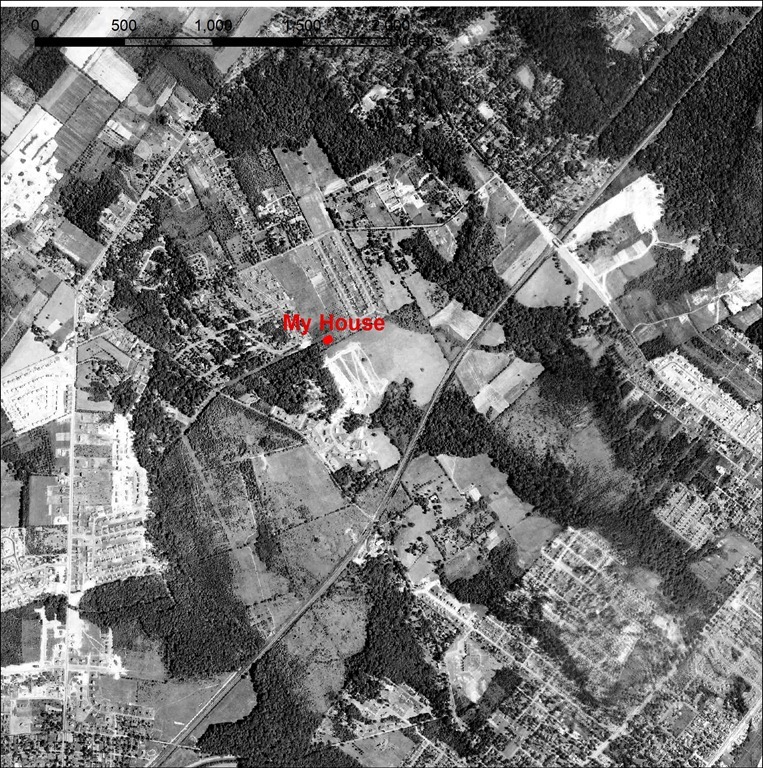 Historically, the field seems to have predated our street, but it does not appear on the 1937 aerial photographs. 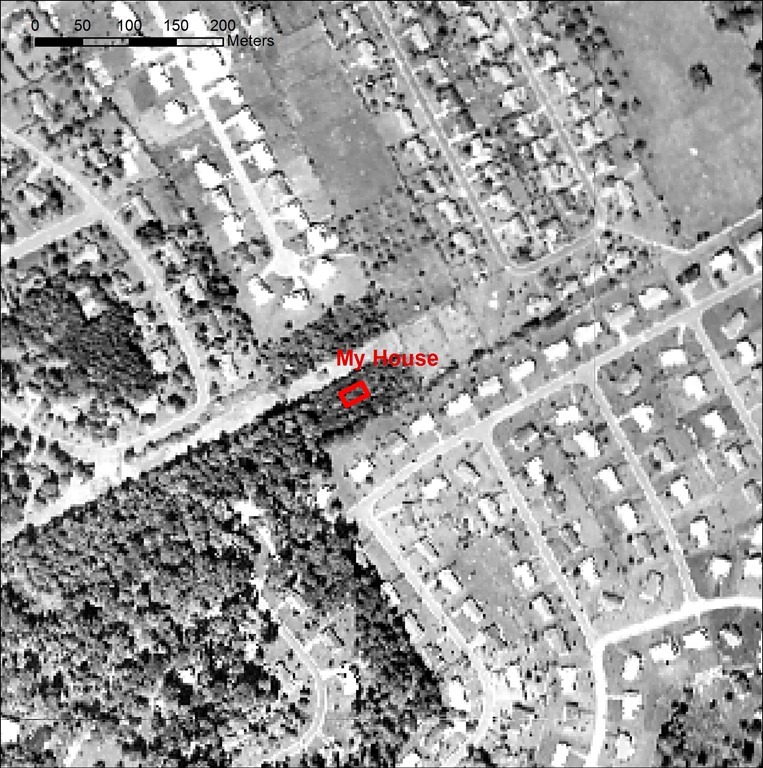 This is based on the 1937 aerial photographs, but I suspect the orthorectifying is a bit off and perhaps should be offset to the north by approximately 25 m.
So the power lines probably cut through the area sometime in the 1940s around the time that Westwood Manor was built (more on this later). 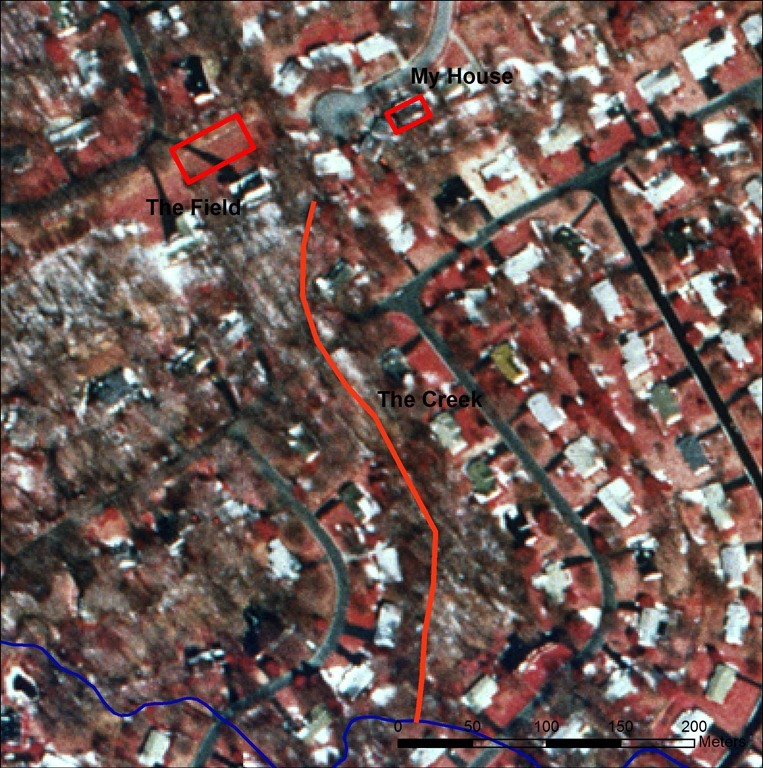 By 2007, the path is visible only as a slight white line and the 1987 house has developed almost the entire open space. Like the Middle Ages, the waste was developed and the imaginative fringe of my childhood universe taken over and developed. This past year my parents put my childhood home on the market. For whatever reason, I didn’t feel any great emotional response to these developments. Maybe it’s because my wife and I have been working hard to create our own home, or maybe it’s because I have spent so little time in my childhood home since I left for graduate school in the early 1990s. Whatever the reason, I began to think about the area where I grew up on my long flight home from Cyprus and during my fitful attempts to negotiate jetlag over the past couple of days. I realized that I did not know very much about where I grew up archaeologically. For example, I had no real idea when my childhood home was built. I had a vague feeling it was built in the 1960s, but nothing more specific than that. (I am regularly shamed by my buddy Kostis Kourelis meditations on his neighborhood in Philadelphia!). My efforts here are a low-key, more academic and hnerdtastic version of this. I grew up in North Wilmington in a typical east coast suburb. My increasingly fragmented childhood memories include an index of hyperlocal places, routes, and features in the landscape. 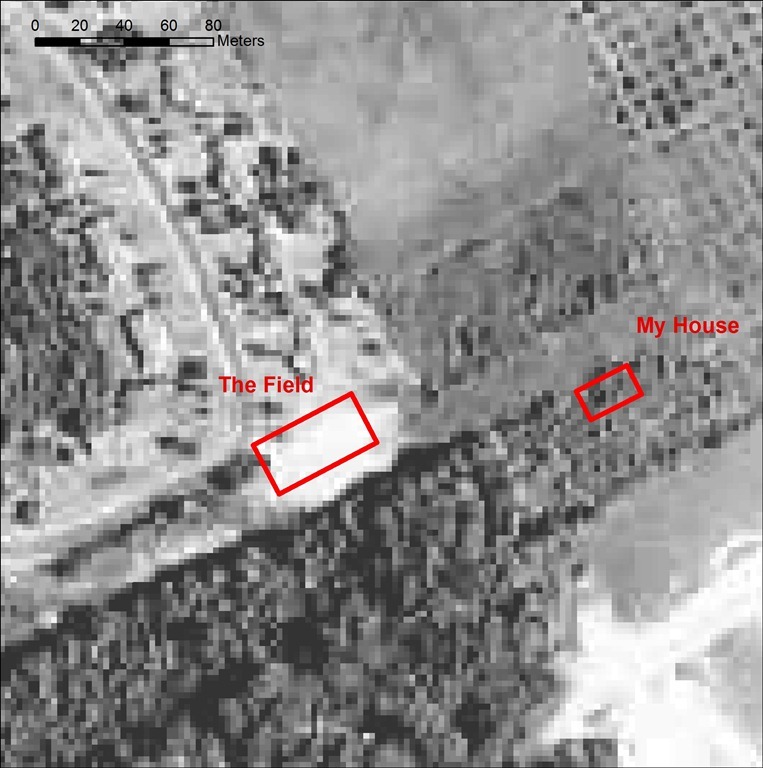 I plan to maps these in relation to contemporary and historical aerial photographs and maps in ArcGIS, and to record some of my memories here in text form. Our summertime activities were centered on the nearby Windybush Swim Club – the local pool and “the street” – Wheatfield Drive – where our family home was. Our street (as I’ll talk about later in more detail) was largely built in the late 1960s. The pool was built in a depression at the “bottom” of Windybush road to serve that community. The community was largely built in the 1950s and the pool was built in 1958. As kids, each Fourth of July we would decorate our bikes and ride them first down our street (Wheatfield Drive) in a parade (presumably organized by the local civic association). After that, we’d parade down Windybush Road to the swim club where we’d have a cook out and do what, as kids, we’d do every day we could all summer – play in the pool. 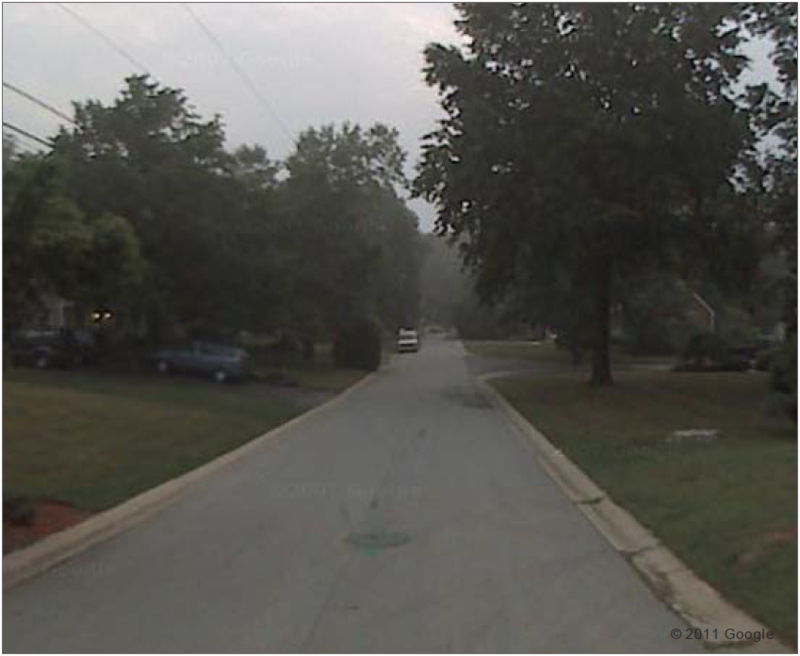 Here’s the Google Streetview perspective of the route down Windybush Road. I plotted our routes here on this GIS map. The background image is from Bing Maps which integrates with ESRI’s ArcGIS (h/t to Brandon Olson). Here I’ve used the 2007 digital 0.25 meter orthophotos of the State of Delaware at a scale of 1:2,400. And here I use the 1968 Agricultural Stabilization and Conservation Service photographs. These are as close as I can get to what this area looked like when I was a kid.